Out of a subway entrance in Center City, between the two office towers of Centre Square, rises a gigantic clothespin. 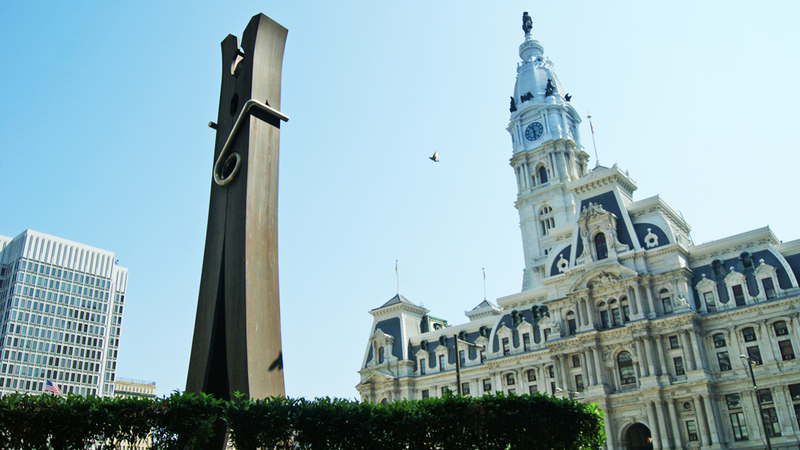 Facing City Hall tower with its venerable sculpture of William Penn, Clothespin has the jolting and humorous effect of a familiar object seen out of context. This witty monument was commissioned by developer Jack Wolgin as part of the Redevelopment Authority’s Percent for Art program. 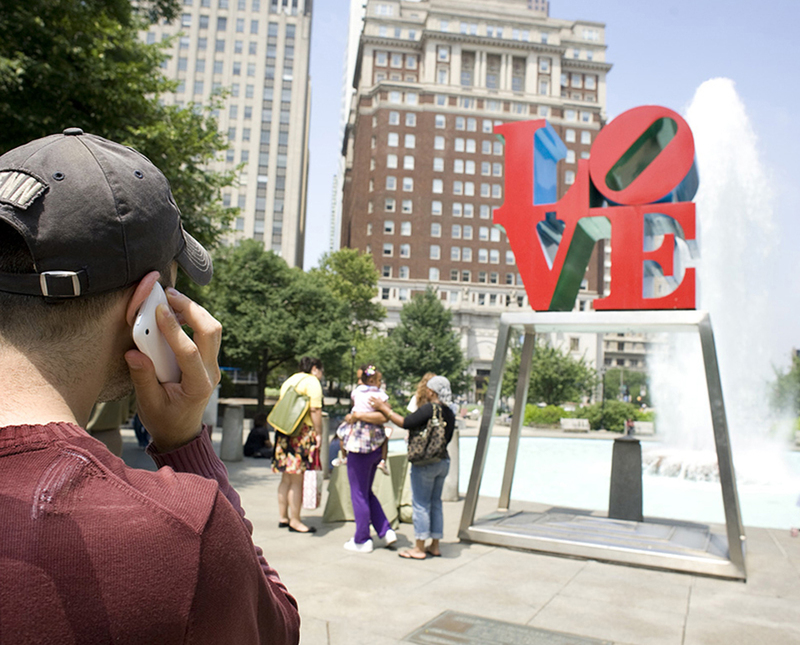 The sculpture invites many interpretations, and Oldenburg himself compared the form to Constantin Brancusi’s famous sculpture “The Kiss” in the Philadelphia Museum of Art. Oldenburg has been noted for his attempts to democratize art, and Clothespin certainly draws a reaction from everyone who passes it. 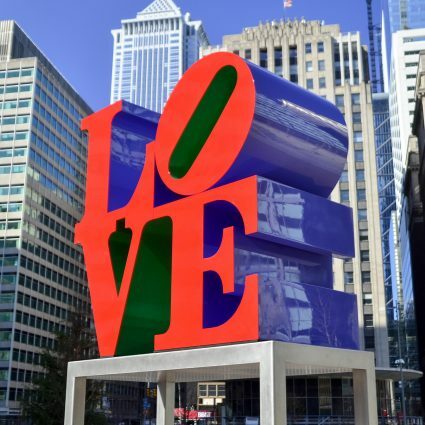 After the installation in 1976, cab drivers, pedestrians, art enthusiasts, and local office workers admired it or joked about it, and it soon became a Philadelphia landmark. 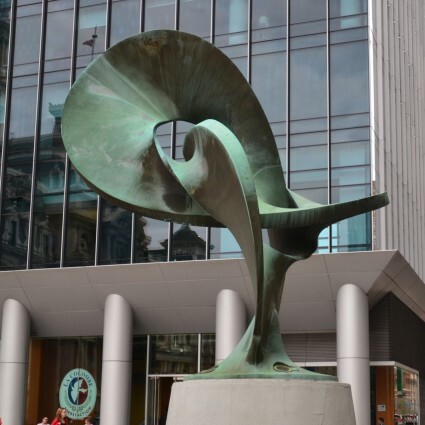 But the sculpture’s resemblance to a daily object should not obscure its artistic qualities. It is not, in fact, a reproduction of an ordinary clothespin, but a sweeping, stylized version. Art critics have written of its “soaring” look and the “velvety” texture of the Cor-Ten steel, which turns a warm reddish-brown as it weathers. The sculpture invites many interpretations, and Oldenburg himself compared the form to Constantin Brancusi’s famous sculpture The Kiss in the Philadelphia Museum of Art. Like Brancusi’s work, Clothespin presents two separate forms merging in an embrace. Claes Oldenburg is the artist who created Clothespin. He is known worldwide for his sculptures that find new meaning in everyday objects by expanding them to a gargantuan scale. 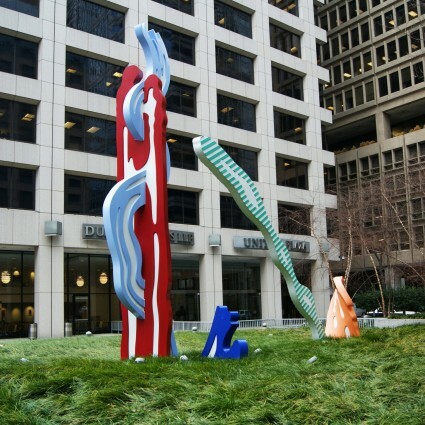 Harry Philbrick is the former Director of the Pennsylvania Academy of Fine Arts in Philadelphia, where Oldenburg’s sculpture Paint Torch was installed in Lenfest Plaza in 2011.